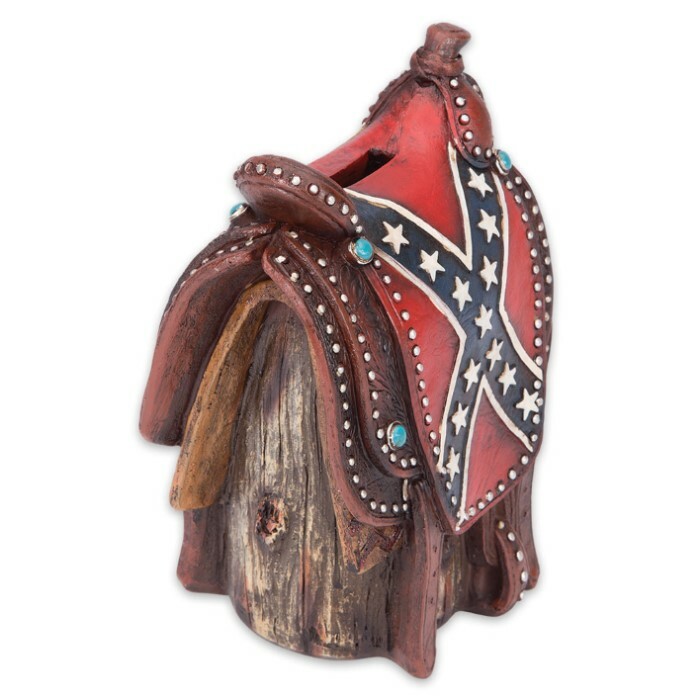 Confederate Flag Saddle Bank - Saddle-Shaped Change Holder - Stars and Bars Motif | BUDK.com - Knives & Swords At The Lowest Prices! Don’t let unsightly scattered coins or a drinking cup-turned-change holder scar your otherwise impeccably decorated home or office. Make your change bank a vibrant, eye-catching showpiece that proclaims your proud southern heritage and/or rebel spirit with this quirky, undeniably cool Confederate Flag Saddle Bank! Vividly colored and beautifully detailed, it flawlessly mirrors a classic Western-style saddle in miniature, complete with simulated turquoise studs and stitched accents. There's a narrow slot at the top for coins and a rubber stopper on the bottom for easy - but not TOO easy - access to your carefully hoarded change. Fill 'er up, empty 'er out, cash 'em in, and go out and buy yourself something nice! Let's face it - no one saves change that's scattered haphazardly around the house! 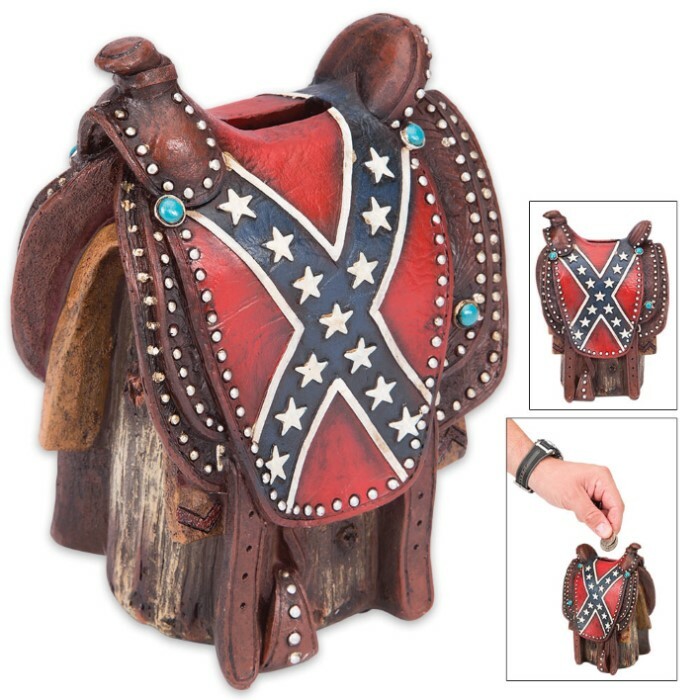 Each side of the saddle is draped with the hallowed "stars and bars" of the Confederate battle flag, a symbol that has come to represent not only southern heritage, but the rebel spirit of ordinary folks in all corners of America. Every artistic detail is rendered in striking raised relief and delicate texture. 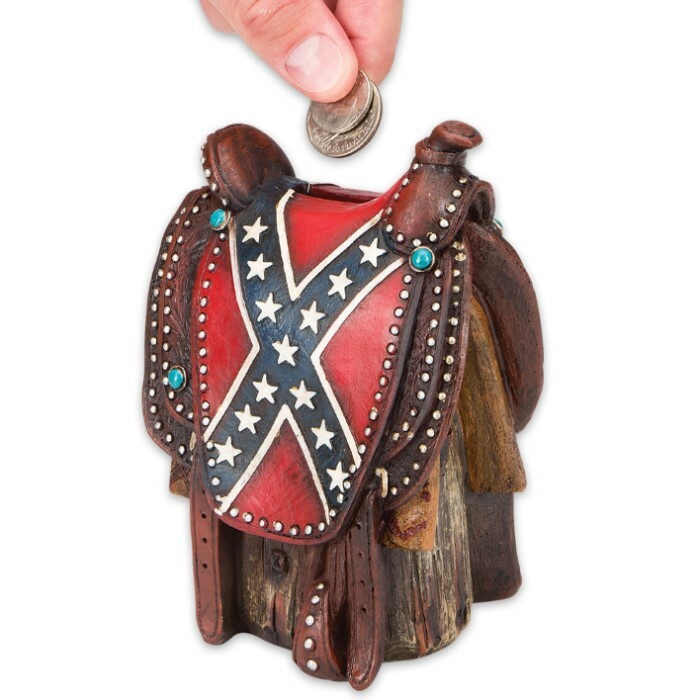 A far cry from your ugly, old nondescript change cup or worn-out piggy bank, the Confederate Flag Saddle Bank is sure to put a smile on every face. Makes a great gift for proud southerners or anyone with a rebel spirit and adventurous sense of style!